Mary Hickman is a graduate of the Iowa Writers’ Workshop where she received an Iowa Arts Fellowship. Her poems have been published in Boston Review, Colorado Review, jubilat, the PEN American Poetry Series, and elsewhere. 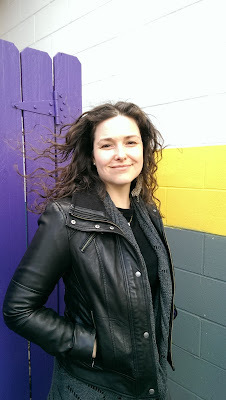 She is the author of This Is the Homeland (Ahsahta Press, 2015) and teaches creative writing at Nebraska Wesleyan University in Lincoln, Nebraska. It has been really wonderful to be able to give the book to the poets I most admire and whose work directly inspired the poems. There is a poem in the book that I wrote in response to a poem by the German poet Anja Utler after I had come across her poem online and been floored by it. A few years later I got to meet Anja, to give a reading with her, and I even managed to convince her to blurb the book! She is also translating a section into German. I’ve been able to participate in these kinds of exchanges much more now that I have the physical object of the book to trade and give. My father is a poet. He doesn’t publish but he did once take a class with Bill Knott when he was still St. Jerome. When I was a child, maybe six or seven, he worked nights and I didn’t get to see him much. But he left little poems for me on post-it notes that I found when I woke. And I began to leave him poems in return. Poetry has always been an act of correspondence for me and comes out of a desire for connection. So far it seems that I’ll write a lot of material quickly in a burst and then revise it for a decade. It’s a slow process for sure. I’m never working on a book from the beginning. I’m mostly just writing a lot of terrible stuff and cursing the muses for deserting me. Then something clicks—I’m there, it’s happening. I don’t know how I got there but I’m there, I’m on the vein. Which of course makes it feel like it will never happen again. The idea of having a larger project really appeals to me but it just isn’t how it has happened so far. Poetry continues to feel like magic. Maddening, maddening magic. I like hearing poems out loud—mine and others—and being in a room of people with a shared investment in the revelatory work of poetry is usually pretty great. Most of the readings I’ve attended in the last decade have been at Prairie Lights Bookstore in Iowa City, Iowa. If you haven’t been, you’ve got to go! Even Obama has been to PL. When I was first entering my MFA program, a good friend advised me to try to hypnotize myself into not thinking about status, career, publishing, etc., and instead to hold onto the mysterious thing that makes me write—to pay attention to that. She said that if I did get freaked out and stop writing, not to worry, to just talk poetry and read read read and think and I’d write again. This advice has made a huge difference in my life. I’m in the middle of writing my dissertation right now and it is difficult! But there is also some comfort in having an outline and following it. And when I can synthesize a pool of ideas and nail an argument, it’s a little like getting a line just right. Anyone who knows me knows I am always searching for the perfect routine. The only constant so far has been coffee. Interviews. Pretty often I’m reading a book of artist’s interviews. David Sylvester’s book of interviews with Francis Bacon is very good. And I just started reading Talking in Tranquility: Interviews with Ted Berrigan (O Books, 1991). I’m very Spicer-focused right now as I’m writing about his fantastic first editions. He’s always a major influence and touchstone for me. I’m also reading Cole Swensen’s beautiful new book Landscapes on a Train. Her ear is flawless! Finally become really fluent in Mandarin. I am tempted to say surfer. But really I do think I would make a decent therapist. When I did try something else (medicine), it made me write even more! I mentioned her before but I’ll emphasize her amazingness here. engulf--enkindle by Anja Utler, trans. Kurt Beals (Burning Deck). I’ve been finishing up edits for my second book, which will be out in 2017, and have been working on some more landscape-driven poems. I spent last year driving back and forth between Iowa and Nebraska and all that road and space has begun to enter my work in a prominent way.